Mel Hein (d 1992) was an American football player for the New York Giants. Hein played fifteen seasons for the Giants (1931-45) and never missed a down due to injury. He is the first player and only offensive lineman to win the NFL MVP award (1938) and he helped the Giants win the championship that season. Mel was part of the first inductee class into the Pro Football Hall of Fame in 1963. In 1969, he was named the center on the NFL 50th Anniversary Team, and was named to the 75th Anniversary Team in 1994. In 1999, despite 55 years having passed since his last game, he was ranked number 74 on The Sporting News' list of the 100 Greatest Football Players. 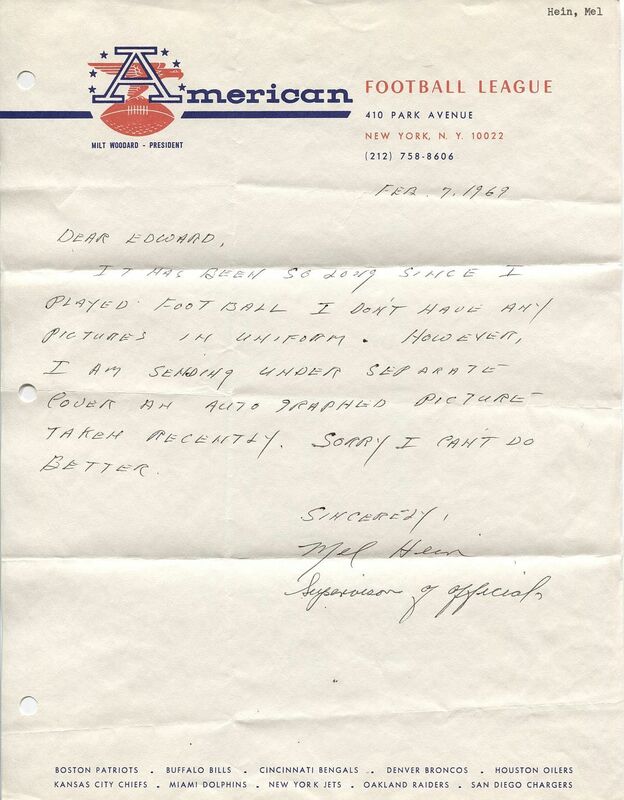 Offered is a very rare American Football League Letterhead from 1969 (the last year of the AFL) with a handwritten letter from this Pro Football Hall of Famer who was the supervisor of officials at the end of the decade. Wow!